Ruler Studio Monogram Photo Display + Winner! Congratulations! Please send an email to alydosdall@gmail.com with “Ruler Studio Winner” in the subject line. Include your name and mailing address and we’ll get you your prize as soon as possible. Now, on to some more Ruler Studio inspiration! 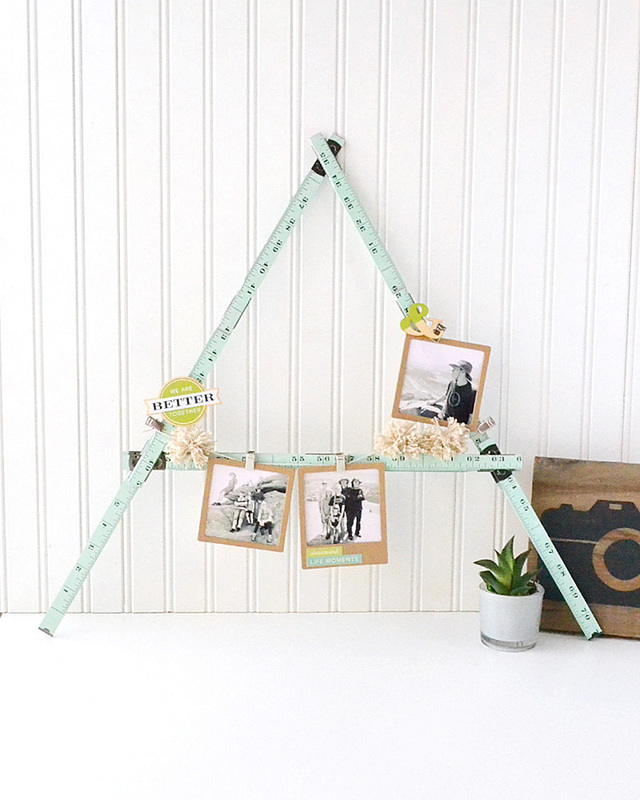 Hey there We R fans, it’s Aly Dosdall here with you today sharing a fabulous way to get your photos out and on display in your home for you and your loved ones to enjoy. 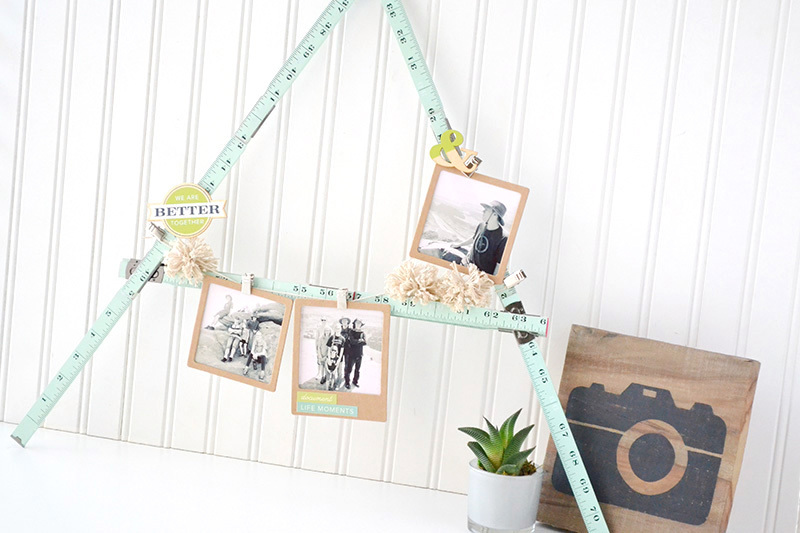 The new Ruler Studio is such a fun and versatile DIY project! You can create so many different things with it, but what really drew me in when I first saw it was what a fabulous photo display it can be. 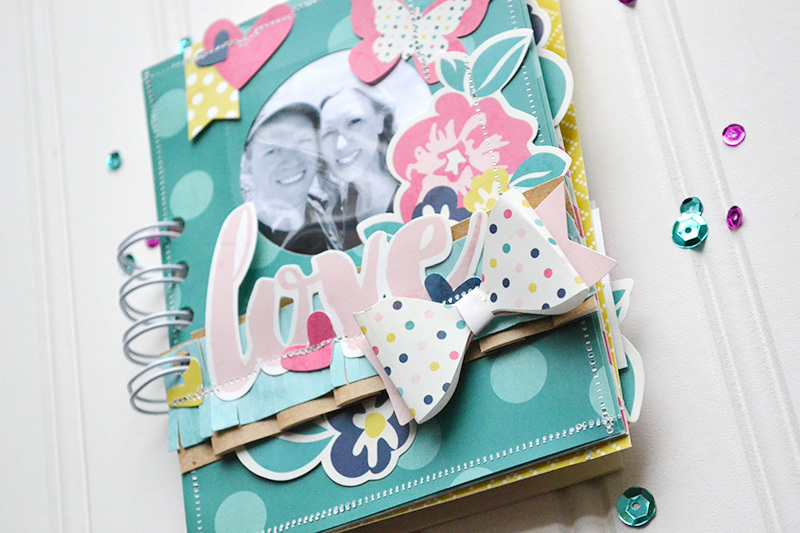 I’m a scrapbooker at heart, and have plenty of albums on the shelves in my craft room. But I also truly believe it is so important to have some of your favorite photos printed and out on display in your home for you and your loved ones to see everyday. The Ruler Studio is a unique and stylish way to do just that! I have a small shelf in my craft room that I love to redecorate every few months, and it’s the perfect place for this project. I shaped my Mint color 9 inch folding ruler into an “A” monogram for Aly. Since the shelf my ruler monogram sits on is right above my scrapbook paper wall border which is bright and colorful, I kept my project fairly simple to not compete with it. I printed three photos of our family from a recent vacation and added them to some of the kraft color Picture Frames. Then I used the Natural String and Picture Clips to hang them on my monogram. 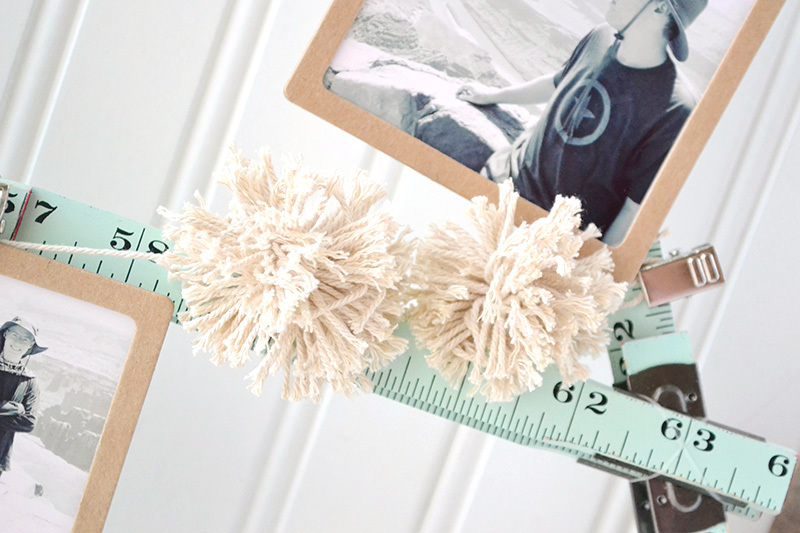 I used the Natural String and DIY Party Pom Pom Makers to make some poms to hang on my monogram. I love the organic texture they add! One of my favorite things about the Ruler Studio is that you can easily change it up whenever you want. 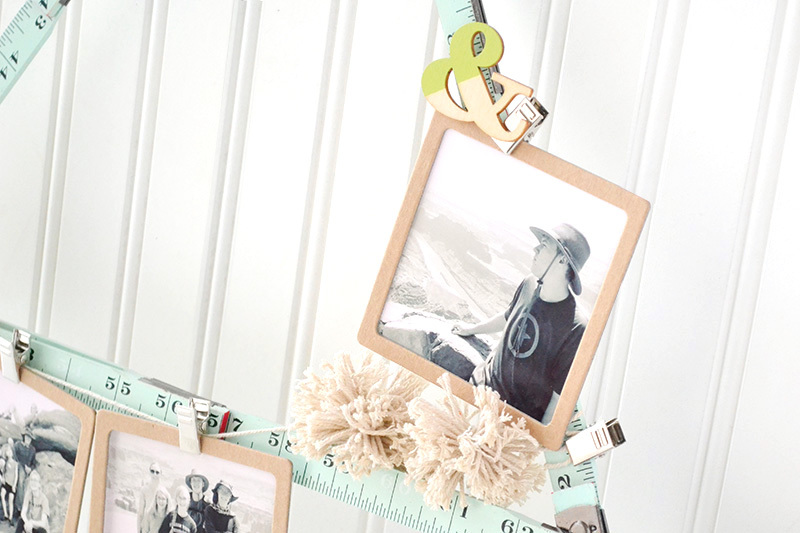 You can fold the rulers into a different shape, change out your photos in the Picture Clips, add a light strand, or adhere cards and ephemera to the rulers with the foam dots. In a few months I’ll be ready to repurpose this project into something new! So, what do you think about the new Ruler Studio? How would you use it in your home decor? As her collection of accessories grows, I have struggled to find a way to keep her go-to hair clips and play jewelry within reach. I found my solution in the 12 inch white ruler. 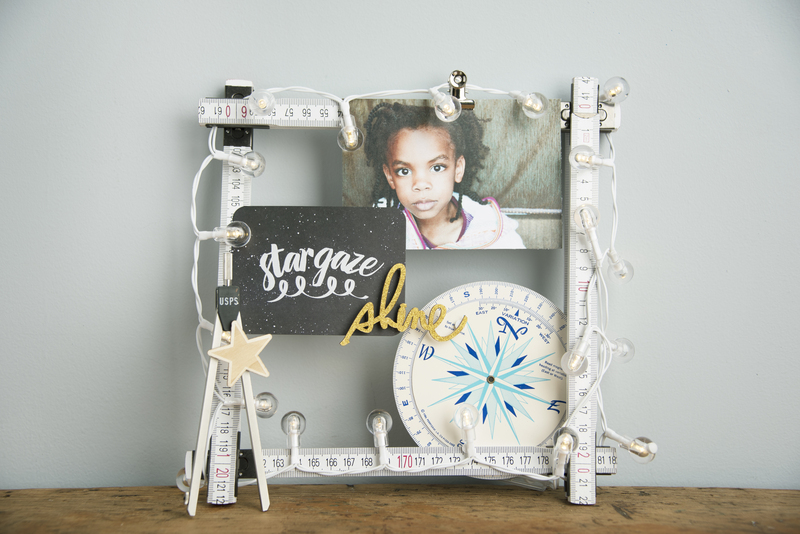 I shaped the ruler into a star (because, let’s be honest – baby girl is the star of the show around here) and used the glass knobs and hooks to create hangers for necklaces and bracelets. It was easy to bend the ruler into the star (just bend every other hinge) and the foam tabs made it easy to secure the ends and overlapping parts in place. Hair clips secure themselves to the ruler and sunglasses tuck nicely over the ruler’s edge. This arrangement is hanging over her changing table. Sometimes while I am doing her hair or changing her clothes, I need her to focus on something to stay still. Clipping a favorite photo of “Mommy! Me!” to the star has been a great way to grab her attention and decorate the ruler. 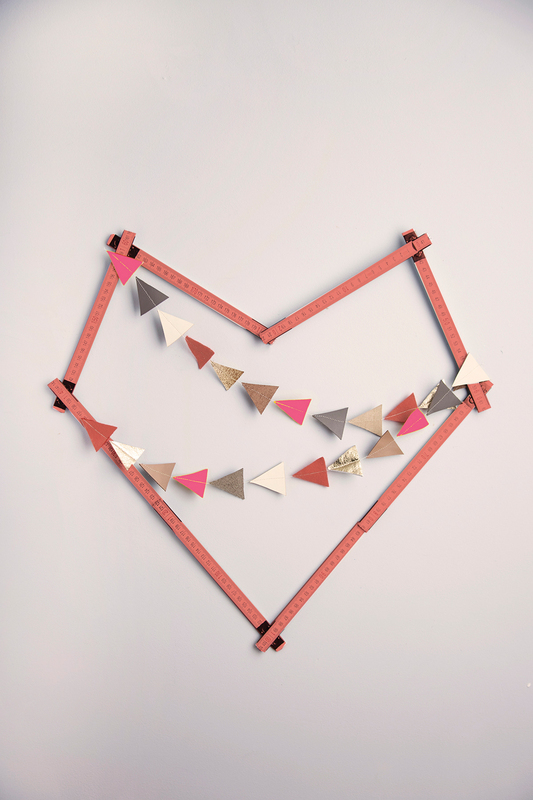 I already have plans for another piece of ruler décor for her room, I love this one so much! 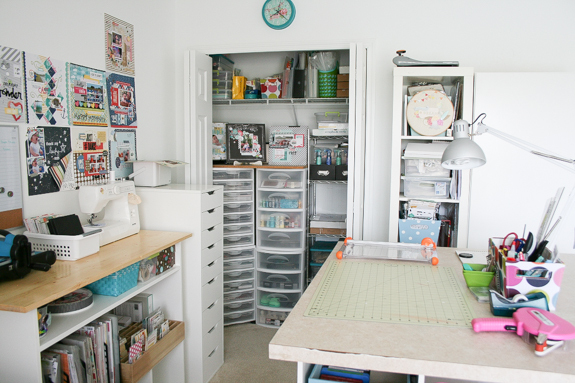 If you’re looking for a unique way to organize accessories, for a little one or even yourself, the ruler studio is a fabulous option! Thanks for stopping by today. Have a good one! Hello! Amanda Coleman here today. 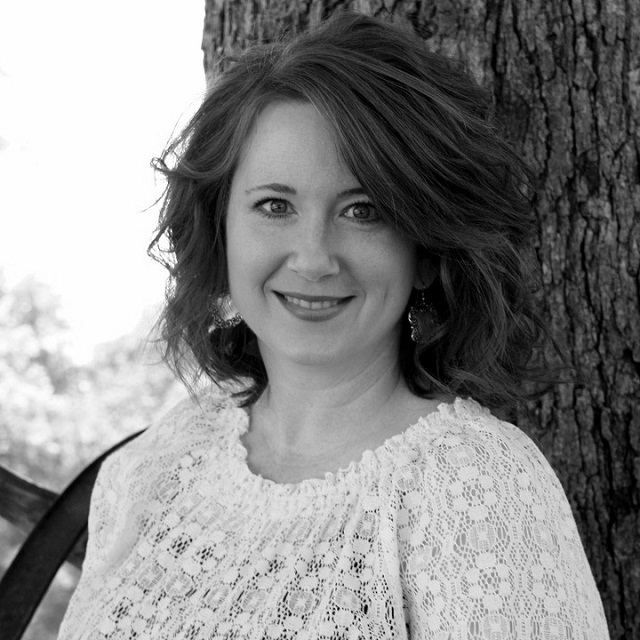 I am beyond excited to be sharing my first project with you on the WRMK blog. WRMK’s new products are fantastic and versatile. If you aren’t excited already, you will be soon! 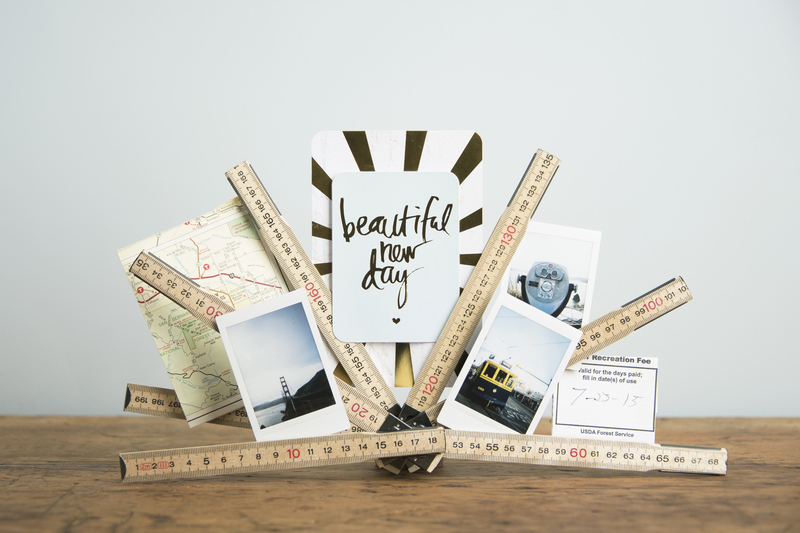 The new Ruler Studio foldable rulers and accessories are positively irresistible. I love that they are both fun and functional. I sat at my desk a while ago and started playing around with the 6” natural ruler and experimented with the shapes I could make. Eventually I ended up with a heart shape and I fell in love. 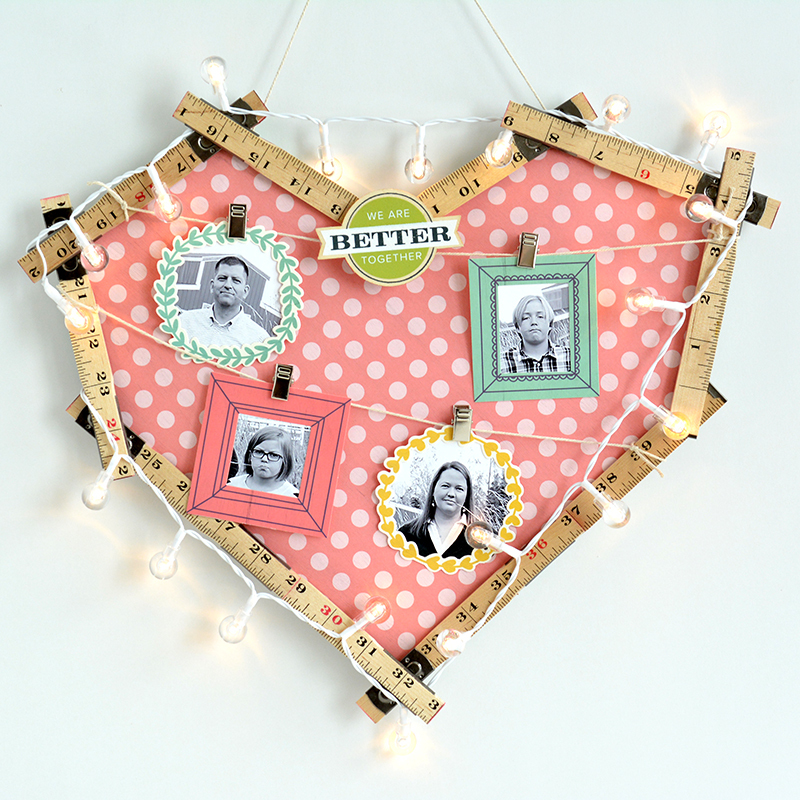 Quirky and whimsical, I thought this wooden ruler heart would make a fun frame. Rather than leave the frame empty, I decided to back it with a piece of patterned paper. 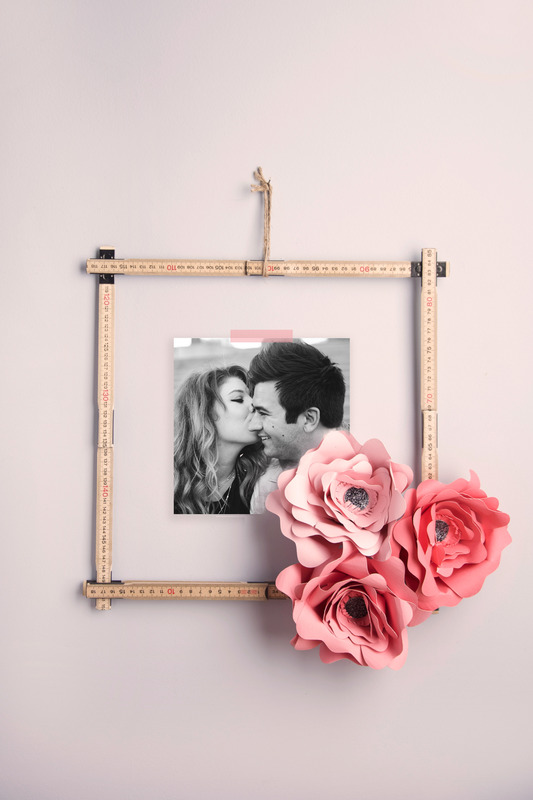 This is an easy way to customize your frame for your space. I used coordinating die cut frames and hung some photos to some natural string with the metal clips. So easy. This is the first photo frame in my home to be embellished with lights. Now I want to put lights on all the things! The Ruler Studio Bulb Strand is powered with batteries so you can put them anywhere in your house. 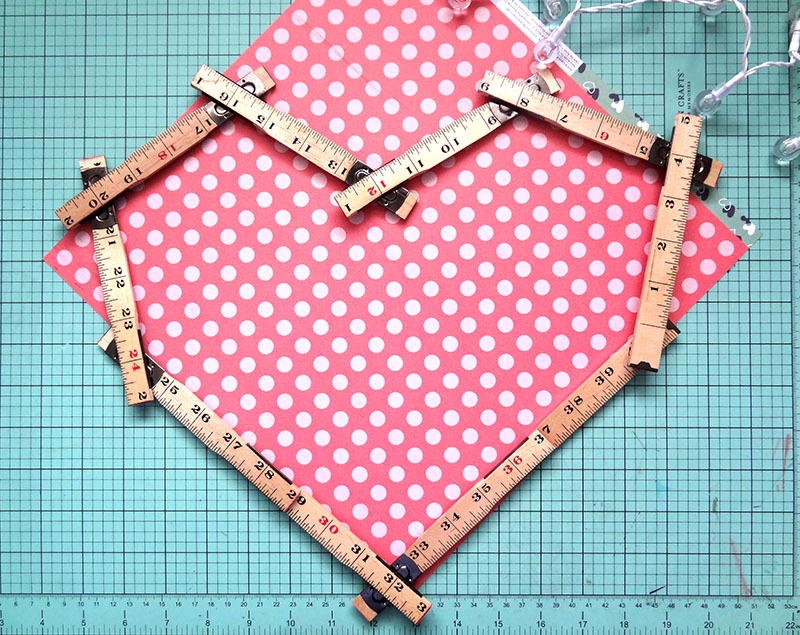 Folded into a heart shape, the 6” folded ruler fits perfectly over a 12”x12” piece of patterned paper. After you have shaped your frame, adhere the ruler contact points to the paper with a strong adhesive. Trim the excess paper with a craft knife. 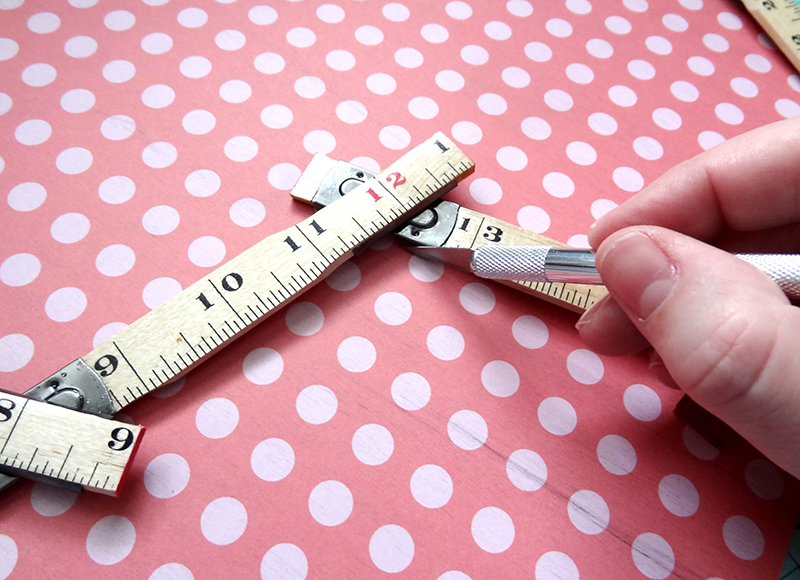 The wide ruler is pretty forgiving so your cut lines don’t have to be perfect. Experiment with the arrangement of embellishments, strings, lights and clips until you find the arrangement that suits you perfectly. 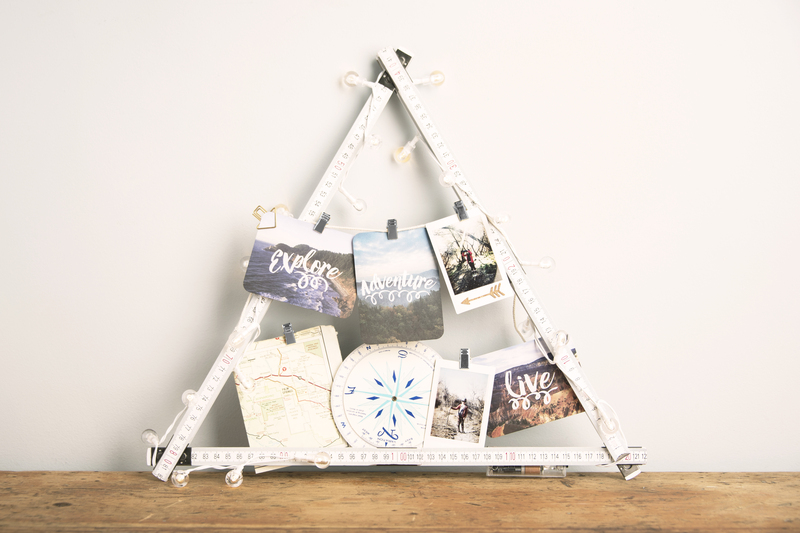 What would you put in a Ruler Studio frame? Happy Crafting! We’re taking a little break from Ruler Studio Week to share something super fun today! There’s been a lot of excitement and buzz about the newest member of our Punch Board family, the Alphabet Punch Board! 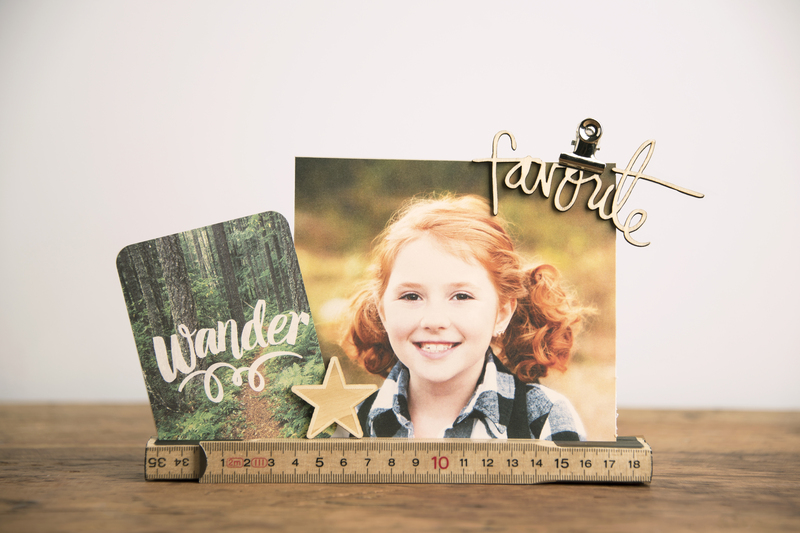 Today we’re thrilled to share more details about this awesome new tool, plus a video demo so you can see just how easy it is to create letters for your paper craft projects using this new punch board. The Alphabet Punch Board creates 3×5 inch letters and numbers using various combinations of cuts and punches. 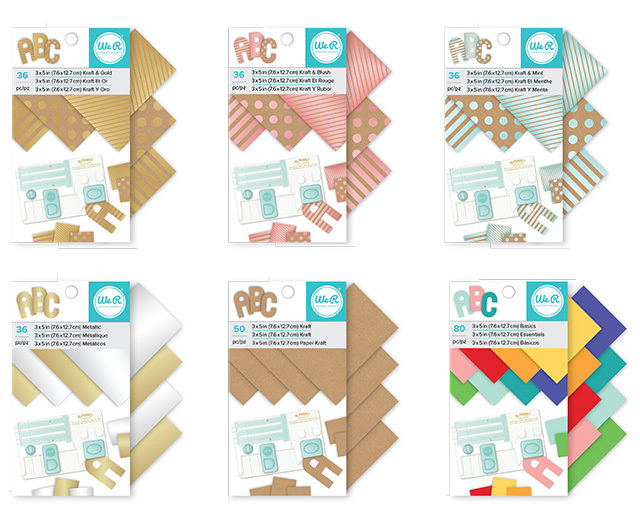 Use your own choice of paper, or choose from several pre-cut 3×5 paper pads sold separately. Easily create any letter or number for scrapbook pages, cards, posters, garlands, bulletin boards, display boards, school projects. and more! Check out how easy it is to make letters and numbers with the new Alphabet Punch Board in this demo video. 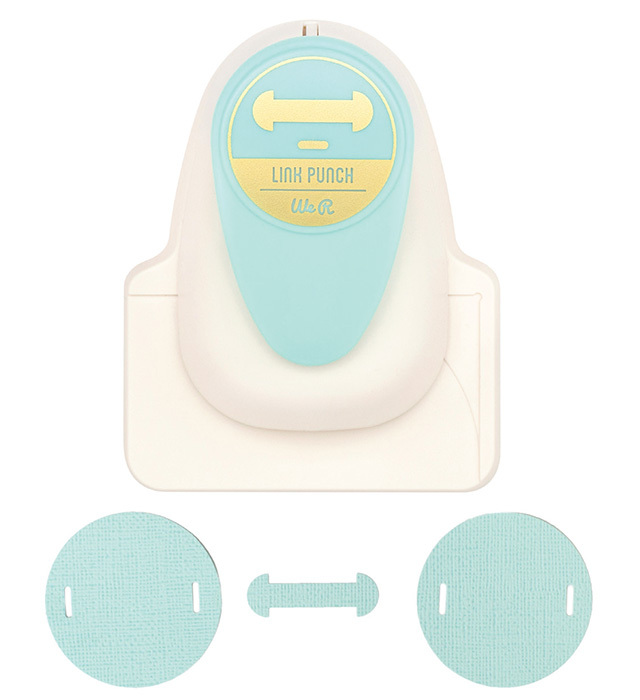 Plus, use our new Link Punch to quickly and easily link letters (or other paper shapes) together to form garlands, banners, and decor for any occasion. The Alphabet Punch Board is now available to all retailers internationally, and exclusively at HSN in the U.S. until Feb 24th when it will be available to all retailers in the U.S. as well. 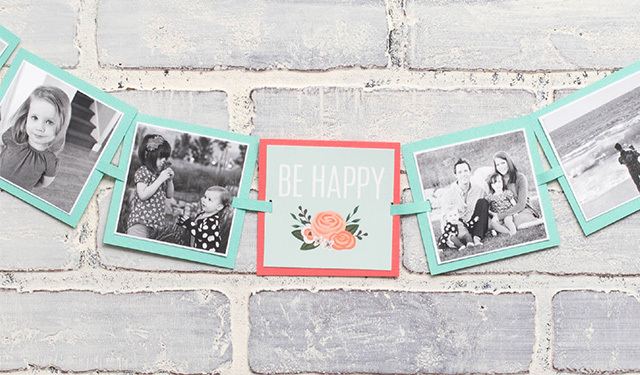 Watch for some project inspiration from our design team, plus a giveaway here on the blog in the next few weeks! Come back tomorrow, and the rest of the week, for more Ruler Studio inspiration! Ruler Studio Projects + Giveaway! Hello, and welcome to Ruler Studio Week! Our design team has been busy creating projects with this fun new line, and we can’t wait for you to see what they’ve come up with. First off, take a peek at some project inspiration from our fabulous in-house design team, and when you’re done with that, scroll down to enter our Ruler Studio grab bag giveaway. Enjoy! You can shape the folding rulers into a simple monogram or photo frame. They make a great piece of holiday decor! Keep jewelry, accessories, photos, receipts, or other papers organized. 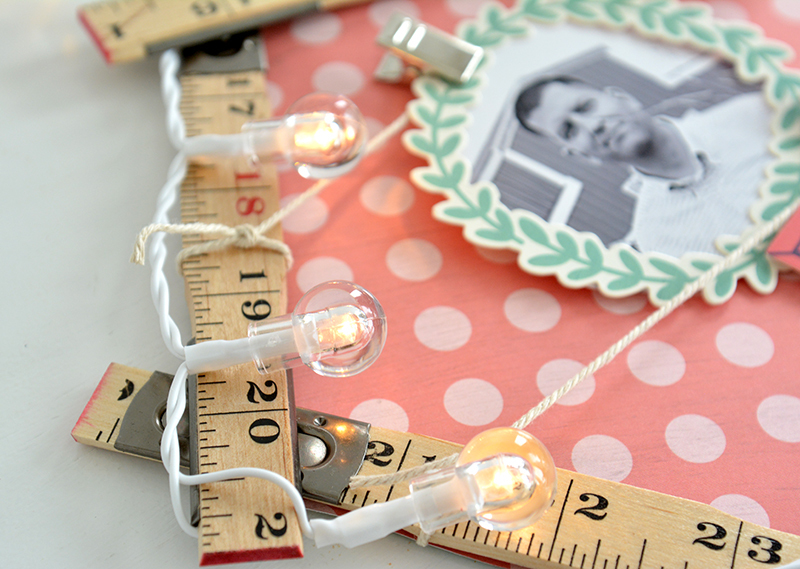 Add the Ruler Studio LED Light Strand for a fun look! Display photos, journaling cards, and other small papers when you shape the folding rulers into a desktop stand. 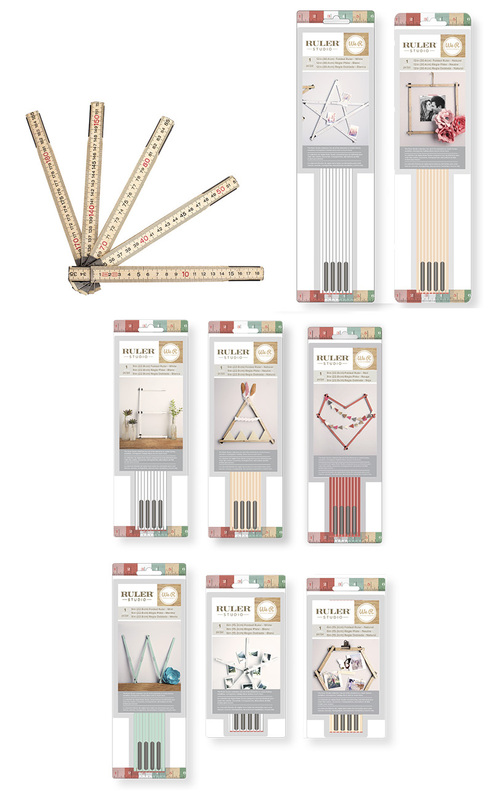 If you’d like to be considered for our Ruler Studio grab bag giveaway, please leave a comment below telling us how you would use this fun new collection in your home. Comments will remain open until Thursday, Jan 28 at midnight. We’ll announce a random winner on Friday, Jan 29th here on the blog. Good luck, and remember to check back to see if you won! Hello friends! Have you subscribed to our YouTube channel? We’ve got tons of tool demos, tutorials, and project ideas to inspire you and help you get the most out of your favorite We R products, so be sure to check it out. We thought it would be fun today to share one of our recent project videos using our Fuse tool with the FUSEables collection. Our FUSEables Card Kit is great for making cards with the Photo Sleeve Fuse, but in this project video Aly Dosdall shows you how to use the kit to make an easy but darling mini album with The Cinch. Scroll down to find the video below the photos. 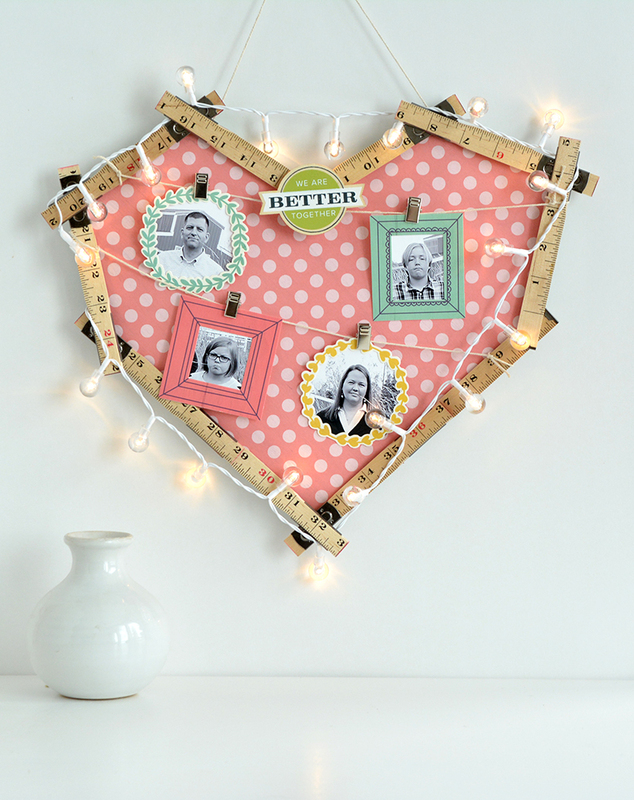 Isn’t this a great gift idea for your sweetie for Valentine’s Day? That’s right, we’ve got the scoop on another new release today! Check out the Organization Gallery–our versatile storage, organization, and decor system. 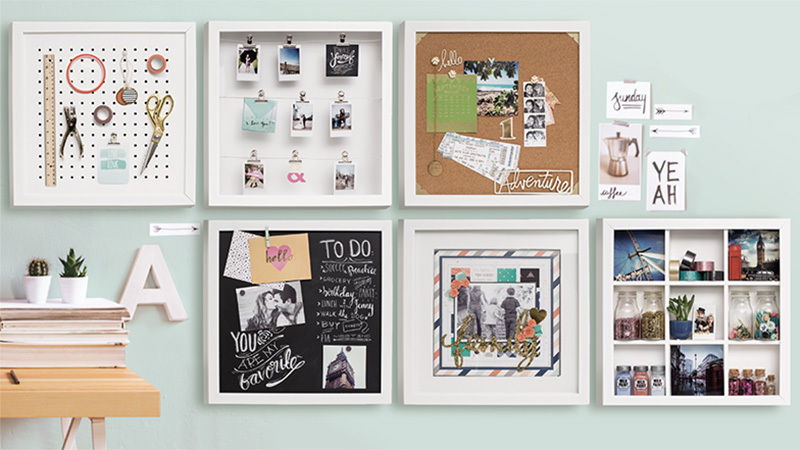 Stay organized with the stylish look of a gallery wall. 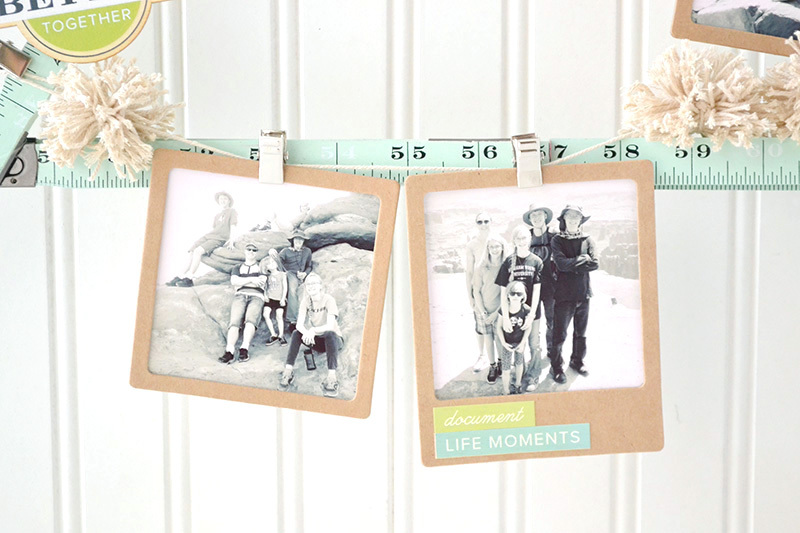 Pin-up, store, or hang photos, scrapbook pages, craft essentials, and more. 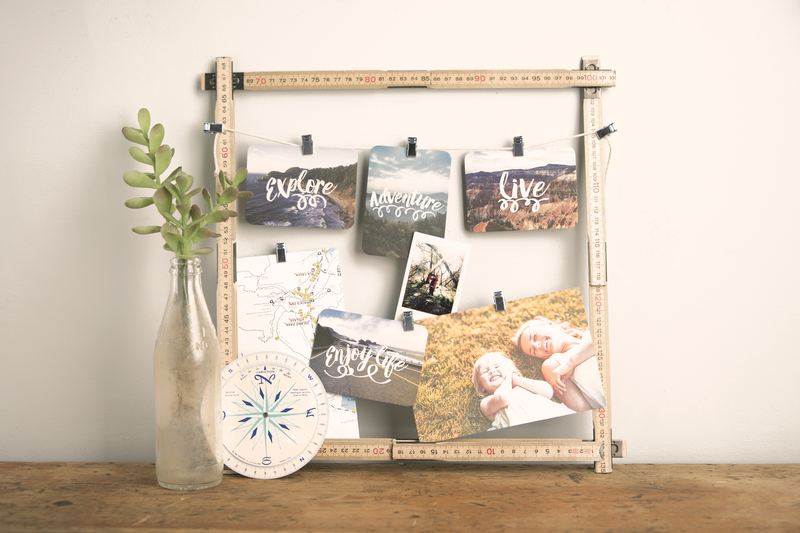 Mix and match any of the 6 frames together to create a customized organization system that adds style to any room. 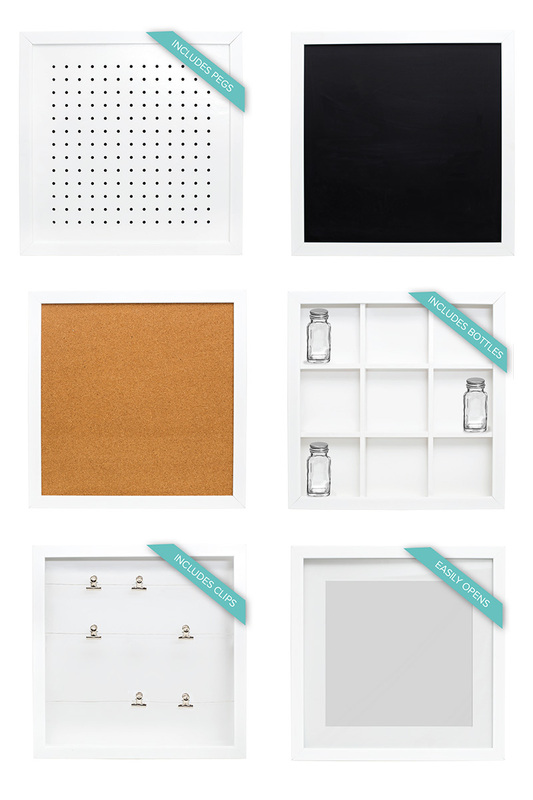 Choose from our Peg Board Frame, Magnetic Chalkboard Frame, Corkboard Frame, Storage Frame, Clip Frame, or Hinged Display Frame. Watch for some Organization Gallery ideas and inspiration from our design team over the next several weeks. 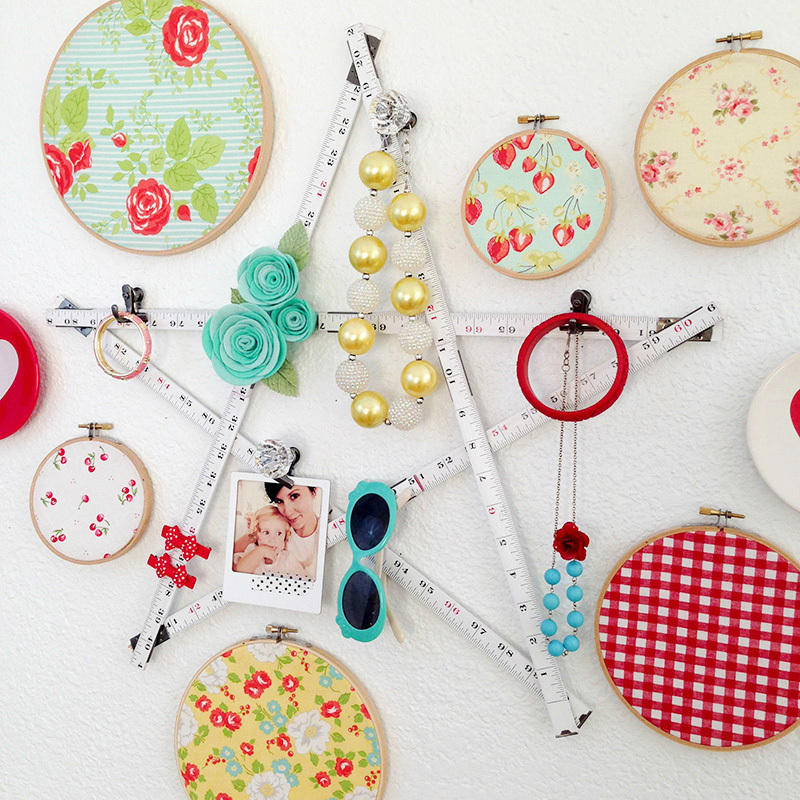 Which of these frames would you use in your craft space? How would you use it? Hello We R fans! We’re thrilled to share more details about one of our new releases today–the Ruler Studio! 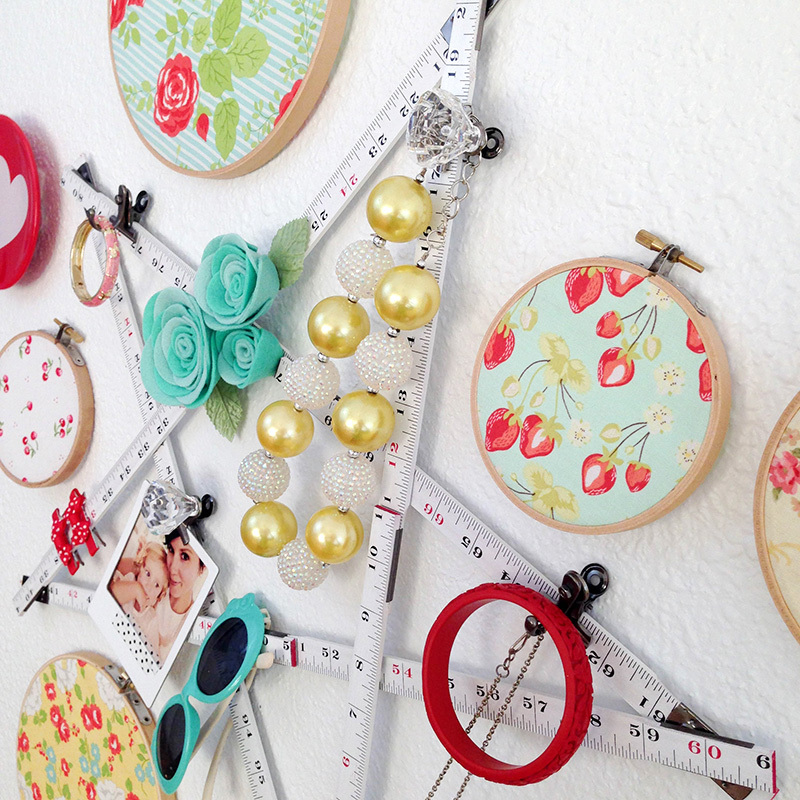 Create unlimited shapes that are perfect for home decor. 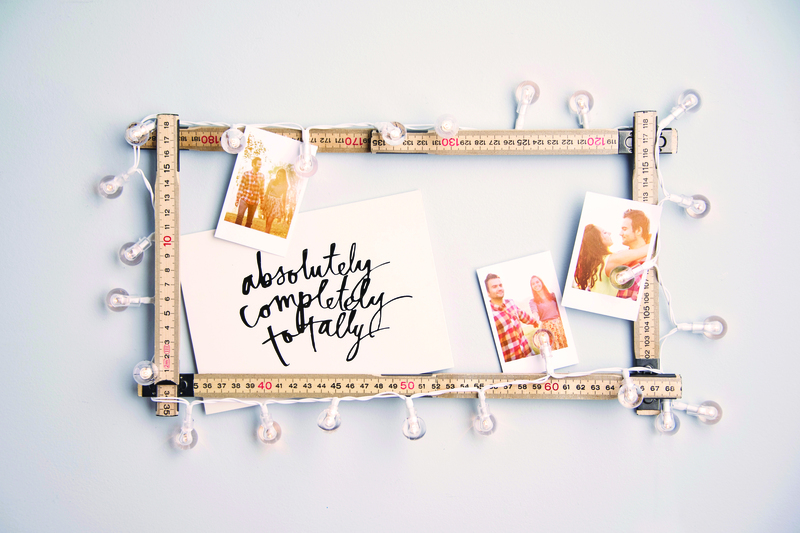 The Ruler Studio collection has all of the elements to create frames, wreaths, monograms, holiday décor, photo displays and so much more. 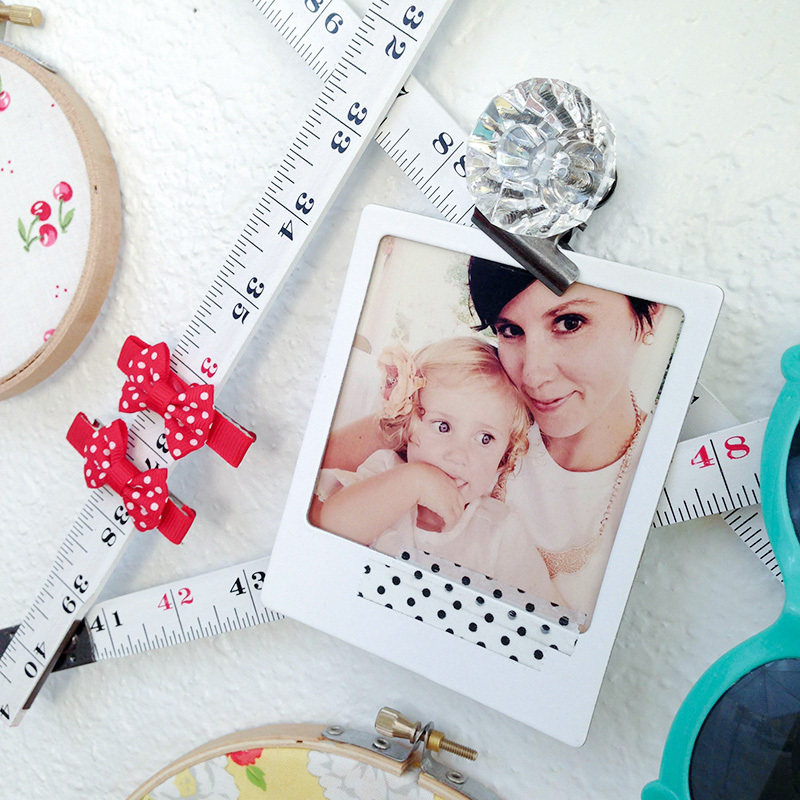 Easily clip photos, ephemera, and cards to your Ruler Studio creations. 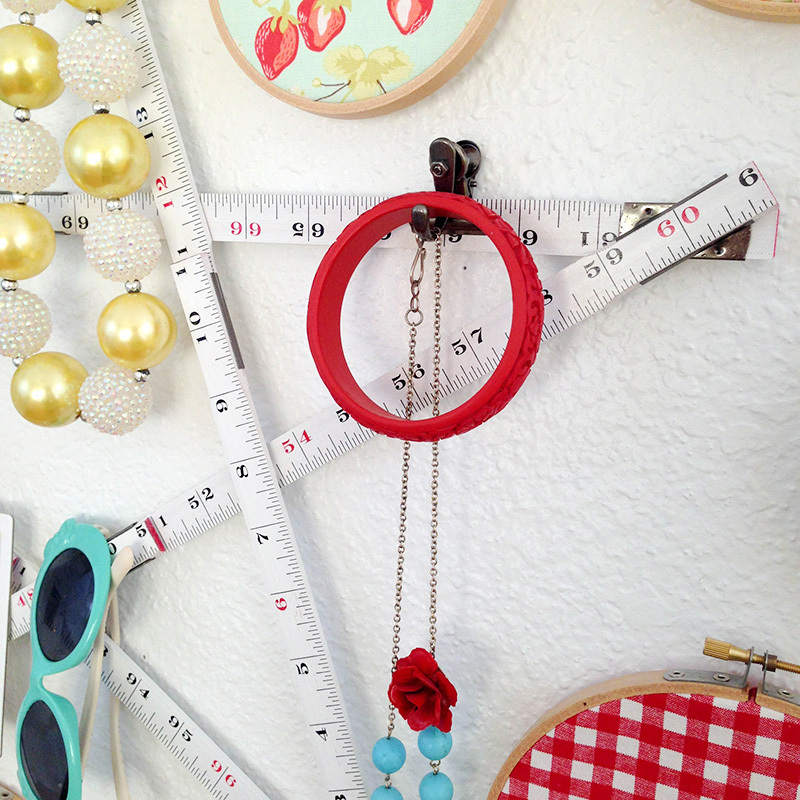 Simply clip hooks on to your Ruler Studio creations to transform them into wall storage for jewelry, scarves, and other hanging items. 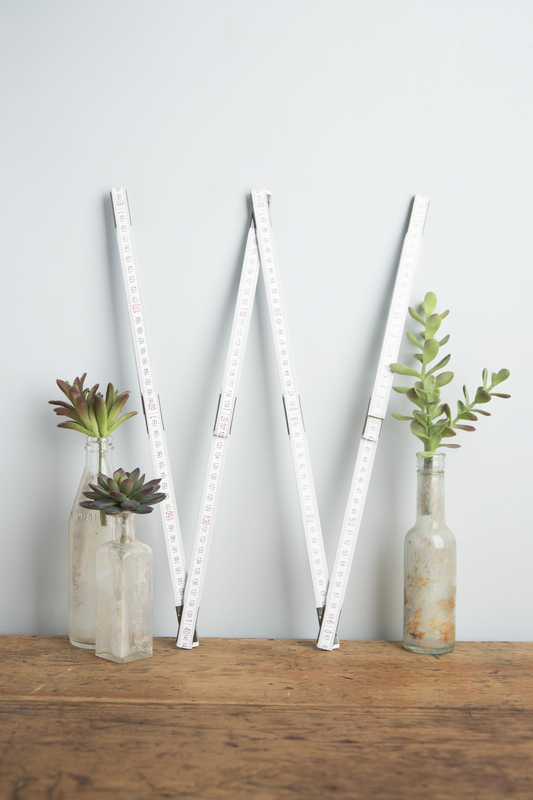 These vintage-inspired folding rulers come in three different sizes–12 inches, 9 inches, and 6 inches. Choose from Natural, Mint, White, and Red. 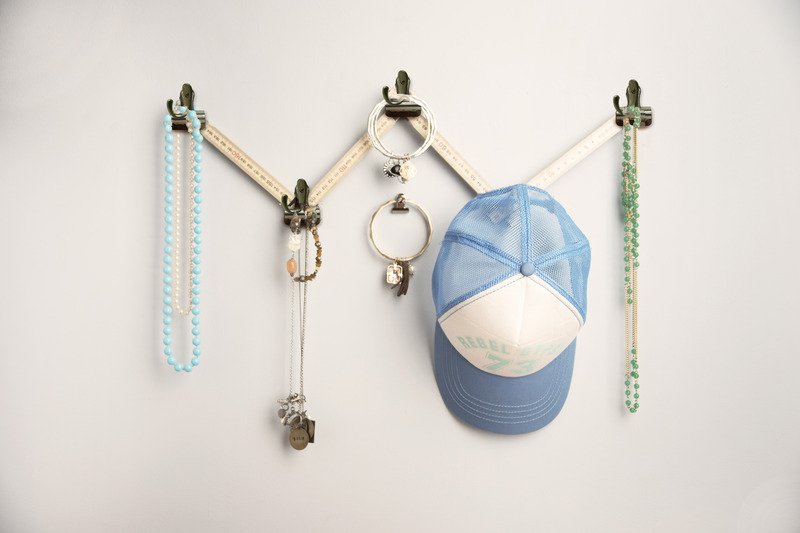 Use our Hanging Clips, Picture Clips, Adhesive Foam Squares, Natural String, Picture Frames, LED Light Strand, Decorative Knob Clips, and Decorative Hook Clips to customize your Ruler Studio creations. Watch for more details, some design team inspiration, and a giveaway here on the blog next week! Howdy We R fans! Today it’s our pleasure to introduce you to our last two 2016 Design Team members. Please say hello to Tessa Buys and Wendy Antenucci! My three rambunctious boys, darling little girl, and patient husband and I call Sacramento, California home. I am a professional dancer and teacher, currently working with the littlest dancers, beginning to competition level. I’ve been lucky enough to work in the crafting industry for several years now and I am very excited to be designing for We R Memory Keepers! Listening to: Justin Beiber’s new album. Don’t judge. It’s actually really good! Loving: The rain! California is in a terrible drought, so I’m grateful for the current downpour. Creating: Party decor. Baby girl turns two in a few weeks! Looking forward to: Making 2016 the best year yet! Favorite We R tool or paper collection: I love my Crop-o-dile! 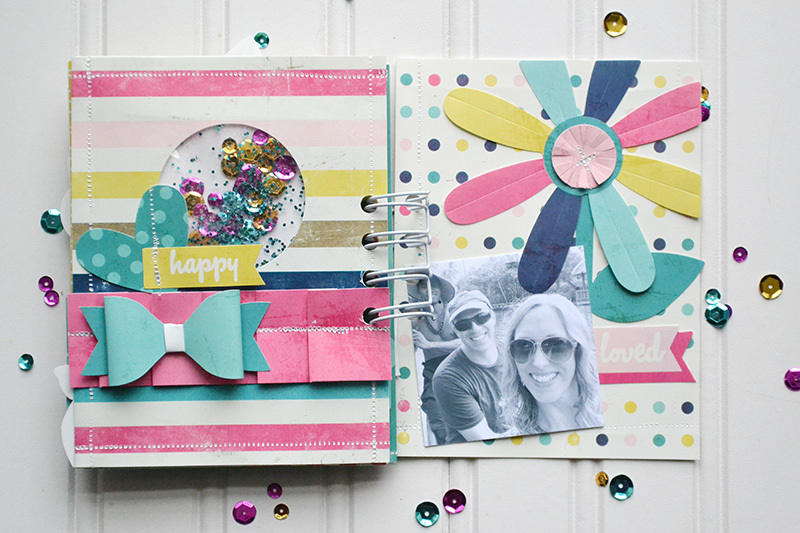 No other scrapbooking tool has come in handy for so many non-scrapbooking tasks. Many a belt has been fixed for my growing boys or shrinking husband! Favorite crafting tip: Since I’m planning my little one’s birthday party, this has been on my mind: You don’t have to make everything you pin. Try the gallon, quart, pint method. Choose something with a big impact to spend the majority of your time on, then something medium-sized for the next chunk of your time, and then spend what time you have left on small details. Your party will look great and you won’t be stressed out (as much). I am married to my wonderful hubby of 16 years and we have 6 kids, ranging from 13-2. 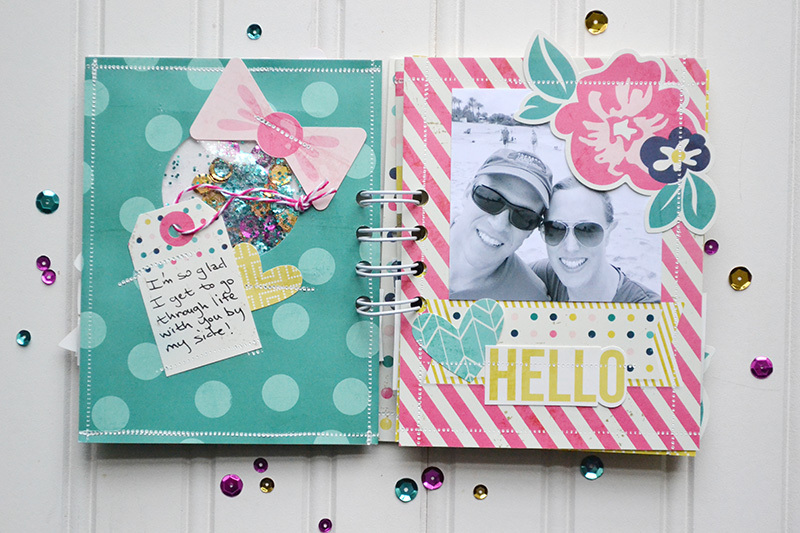 I started scrapbooking shortly after my first child was born in 2002. I am a SAHM and homeschooler so I tend to scrap during my kids rest time; it helps clear my mind and get me through the rest of the day. 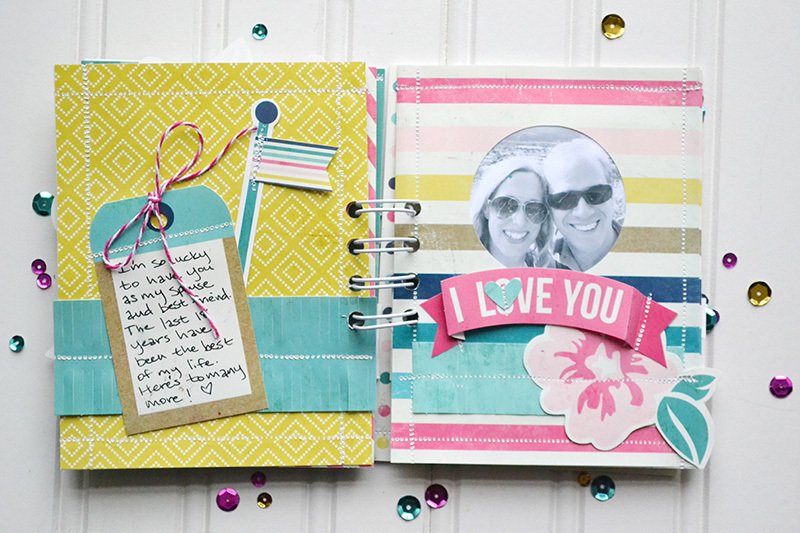 I am all about family and who we are; that is why I scrapbook. Every page I create is a canvas to tell our story, how the Lord has put us together and ordered our steps, and to take the time to really embrace the lesson the Lord is teaching us at that moment. I am a scrapper that adores white space with lots of layers and meaningful elements. 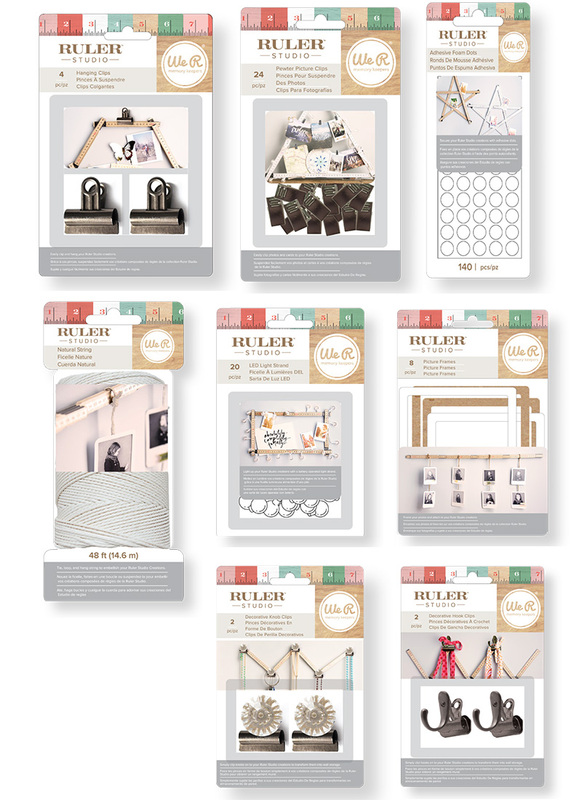 I have been blessed to design for Bella Blvd, Simple Stories, Pebbles, Hip Kit Club, CREATE, and Anna Griffin. I have been published in PaperCrafts & Scrapbooking, Scrapbook & Cards Today, Creating Keepsakes, Cards, Create, Scrapbook Trends, Scrap365, and various online publications. Creating: Lots of memories before we leave FL so I can remember all the fun we had. Looking forward to: What 2016 is going to bring, it is full of great possibility! 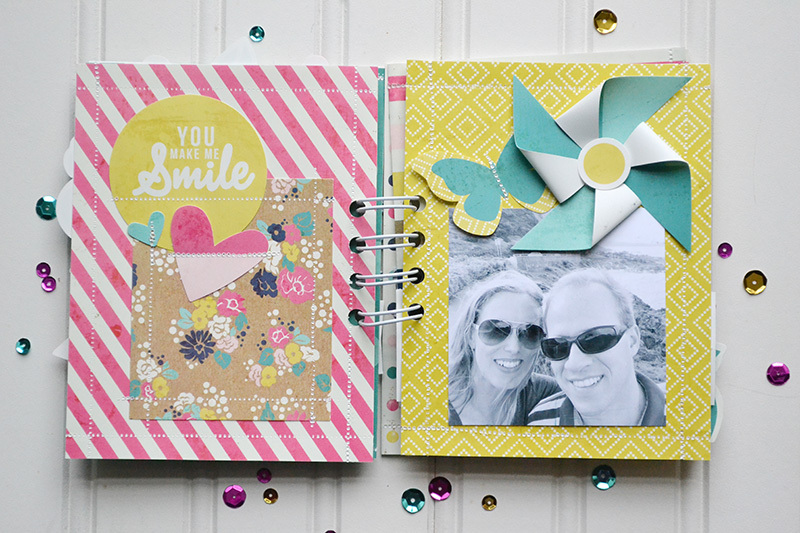 Favorite We R tool or paper collection: I loved creating with the Love Notes collection and I am a big fan of the Pocket Page Protectors. Favorite crafting tip: I am a huge fan of using Project Life cards for layering, titles, and just adding interest to my pages! I even take my leftovers and cut them into 3×4 or 4×6 pieces which I then use to add the many layers I love to have on my pages. Happy Monday We R fans! 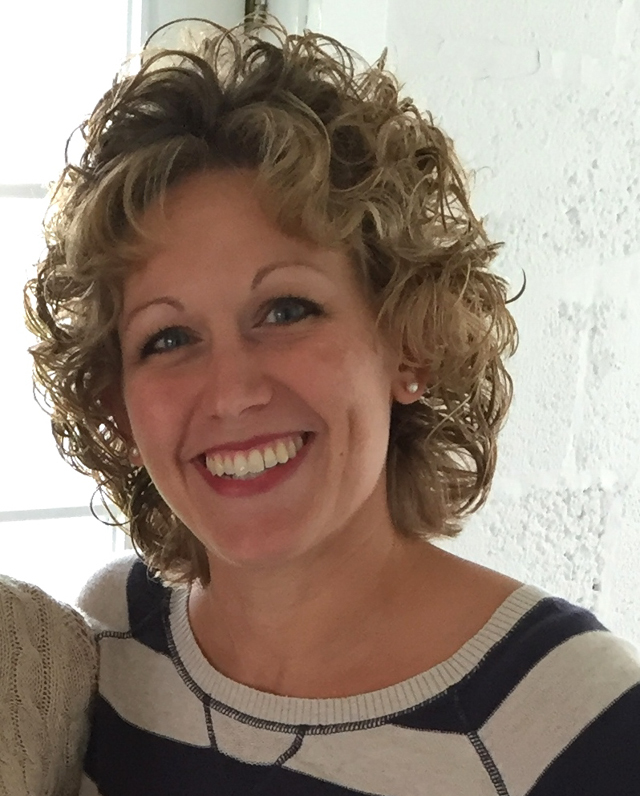 We’re very excited to introduce you to two more of our 2016 Design Team members today. 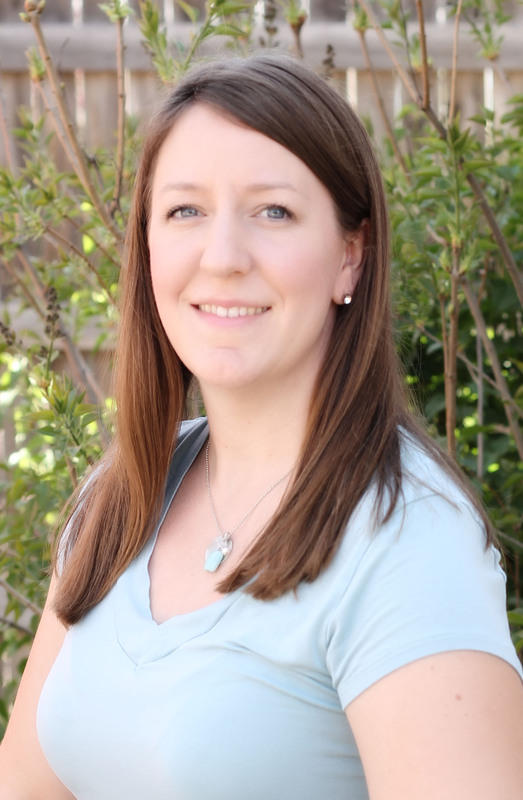 Introducing Laura Silva and Shellye McDaniel! Hi! 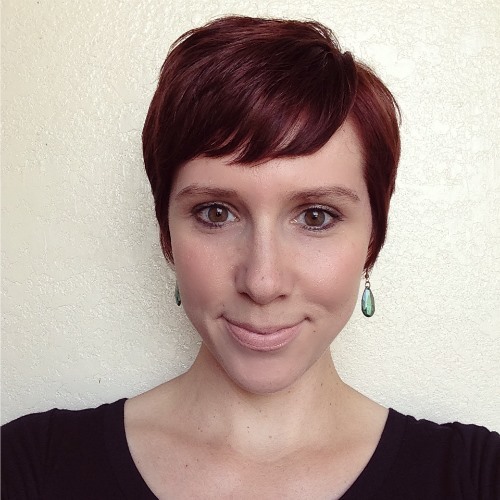 My name is Laura and I blog over at Laura’s Crafty Life. My goal is to inspire others to craft a creative and well-lived life. I share simple craft projects, themed party ideas, organizing tips and tricks, and our adventures in renovating our home. I love to craft and have been making things for as long as I can remember. My mom inspired my love of being creative. I live in Northern Arizona with my husband and two school-aged kids. 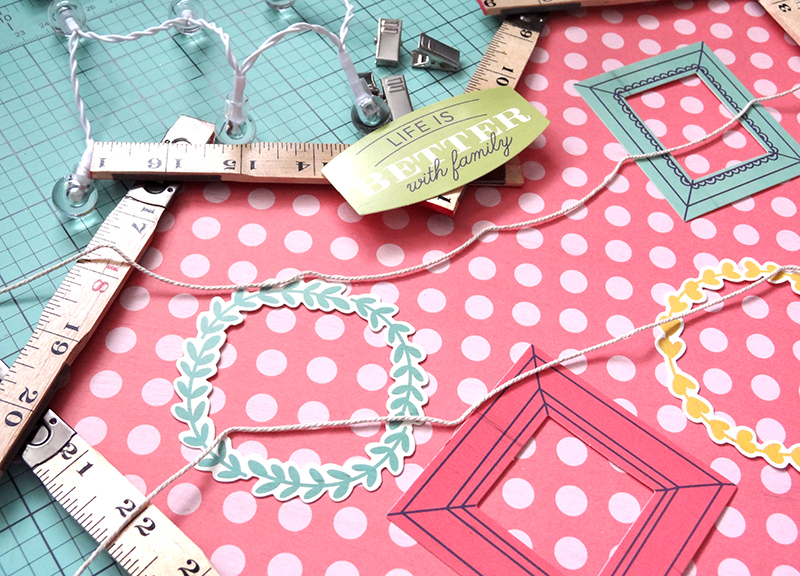 Favorite crafting tip: Don’t be scared to try new crafts or ideas. Some of my best projects have come from what initially I thought were going to be total craft fails. I live on a Northeast Texas ranchette with my husband of 25 years and three children ages 22, 17 and 13. I work PRN as a Labor & Delivery Scrub Nurse. I love all sorts of crafting: papercrafting, hand-lettering, home decor, knitting…I’ll give just about anything a try (although I failed miserably at tole painting!). I also enjoy trying new recipes, perusing Pinterest, organizing, cleaning, singing and visiting with family and friends! 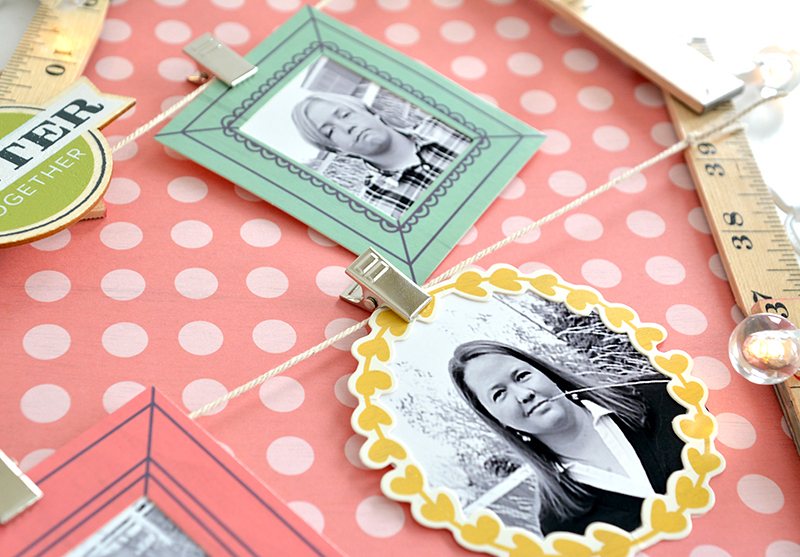 I have been a crafter for as long as I can remember and a papercrafter since 1997. I have served on many manufacturer design teams over the years and teach at my local scrapbook store, as well as Big Picture Classes. Loving: Getting the house organized after the holidays! Favorite We R tool or paper collection: Evolution Advanced and the “Yuletide” Collection has been used for the past three years! 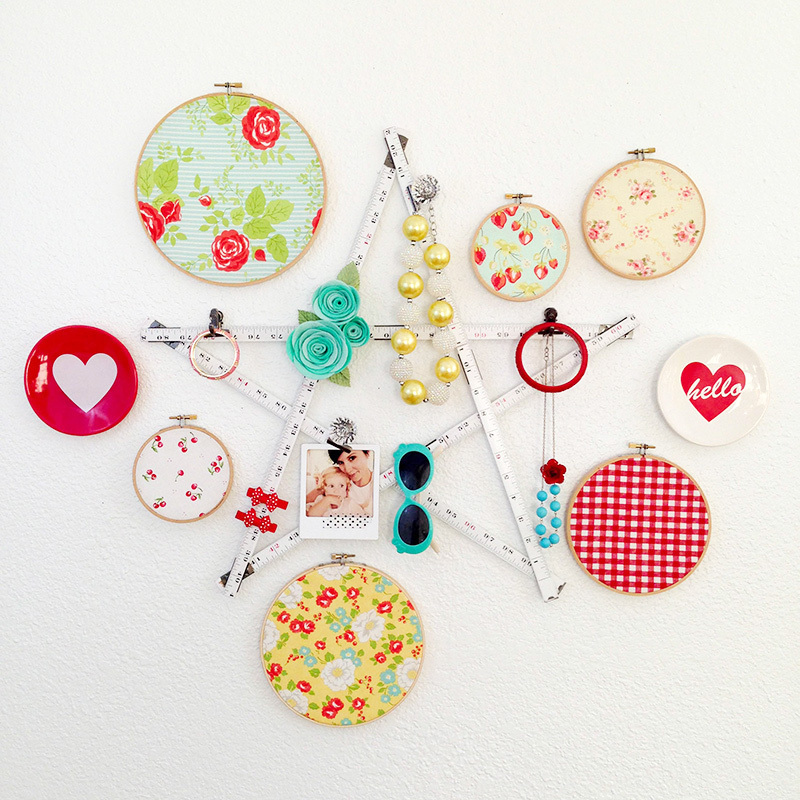 Favorite crafting tip: Don’t trash it! There really isn’t any mistake that’s too big to fix. 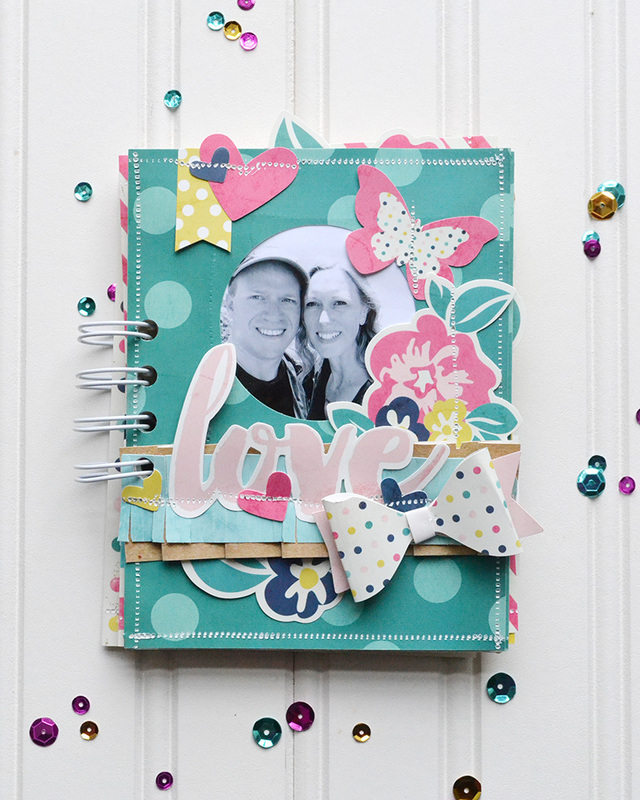 Use embellishments, ribbon or even punch a hole to cover up a mistake.